Did you ever notice that most successful people are good and famous for one particular niche? When you look at highly successful people you will realize that they were famous for one reason. Not only people. Big and successful companies are also famous for one particular niche and they are always specific. People tend to do better and achieve success through dedication to one particular element or work. When people dedicate themselves to one niche they not only tend to do better but also achieve success. We always try and do many different work and try to get good at all of them. That simply won’t happen. You will increase your knowledge base on many different subjects but you won’t be successful in all of those subjects. It’s good to increase your knowledge base on different subjects but it’s bad idea to try and become successful at everything. You don’t see or hear anyone talking about Albert Einstein for dancing. People may have different hobbies and interest. You might have interest in different elements but among those things only one element can make you successful. Of course, there are people good at different fields but they are not known or famous for everything they do. You can master a single discipline and be knowledgeable about many others and be what’s called “well rounded.” This will serve you best. It’s wise to cultivate multiple skills if they multiply your effectiveness when combined. Here, I’m talking about highly successful people NOT average successful people. People might be known for cooking, fashion designing and dancing at the same time but I prefer calling them average successful people. They can’t get highly successful in all of those things. Rather they might get famous for Fashion designing and then limit cooking and dancing as their hobbies. That way they are well rounded. While working, focus entirely on your work. Don’t try and accomplish different works at the same time. When you work on one thing at a time you tend to give your 100% focus and attention to it and the outcome will be excellent but if you try and accomplish 3 different work at the same time then you can’t focus 100% on the same thing meaning the outcome won’t be good. Most of us try to do more than one thing at a time and always want more than one thing at once. We’re not willing to let go of one thing in order to do another. We’re doing one work task while trying to stay on top of email, text messages and social media. We’re talking with a friend while seeing what we’re missing on Facebook and Twitter. We’re eating while planning. Making love while thinking about work. I’d like to share Leo Babauta’s story for this one. The other day while I was visiting a friend, she offered her dog a bone. The dog wanted the bone, but didn’t want to drop the toy animal in his mouth to get the bone. “Jack, you can’t have both at the same time,” my friend said. Most of us are like Jack: we want more than one thing at once. We’re not willing to let go of one thing in order to do another. Like Jack, we think can hold two things in our mouths at once, but actually that’s a fantasy. We can’t taste the food while thinking about what we need to do later. Our mouths may be moving and the food might be swallowed, but there’s no awareness of how the food tastes. Instead, we’re switching back and forth between the planning and the tasting, like a dog going back and forth between a bone and a toy, not content to do just one thing at a time. 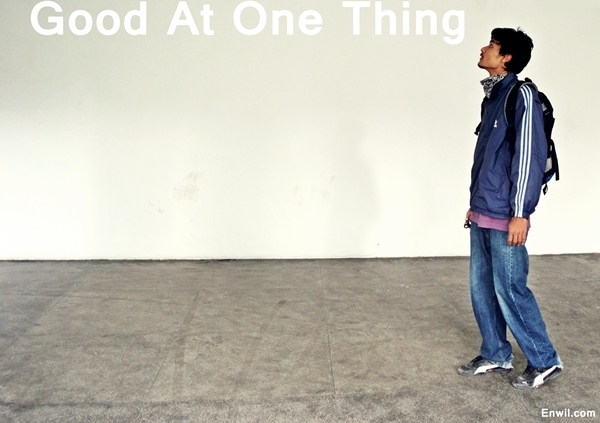 I’m writing this post only about getting good at one thing. If I tried writing about 5 issues in one blog post then readers would get overwhelmed and confused. Overall I wouldn’t be writing this good because my whole focus and concentration would be divided into 5 parts. So, if we realize we can’t have the bone and the toy in our mouth at the same time, then we realize that by giving up the toy, we’ll enjoy the bone so much more. It will be fully tasted, instead of stuffed into a mouth that can’t taste it. That’s true. I’ve had that in mind for so long but couldn’t express in terms of words. I’m loving it soo much! Keep it up!!! Thanks a lot for taking time to read. You are supposed to focus only on Photography. That’s your one thing. Great post! Meditation is something that can also help with the focus and help clear your mind so you’re not thinking about 10 things at once. That’s why I try meditating every morning for sometime. Most people hate the idea of meditating. But, it doesn’t have to be that. Just closing your eyes and thinking about a particular thing can help you meditate. Or just keep looking at your thoughts and where they go. Web designer, blogger, writer. So much for one thing. Haha. Thanks. Now, I’ve been photographing too.